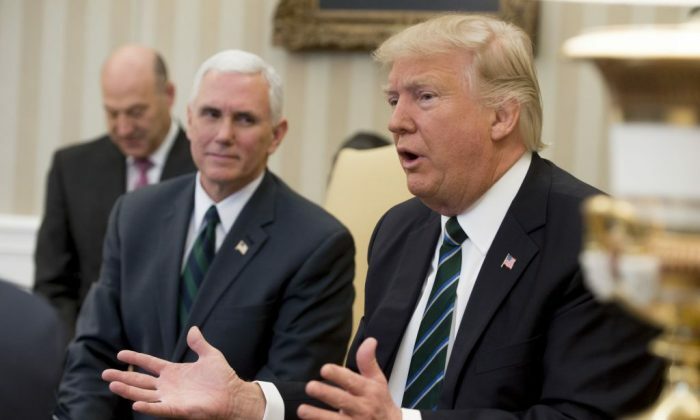 Fulfilling a campaign promise, President Donald Trump signed an executive order Feb. 28 ordering the Environmental Protection Agency (EPA) to roll back the Waters of the United States rule issued by the Obama administration. Federal law authorizes the EPA to regulate “navigable waters.” At issue in the objections to the Waters of the United States rule is what defines these waters. Critics say the rule gives the government the power to regulate every pond, puddle or ditch. Brian Reuwee, spokesperson for the Agricultural Retailers Association, said the rule gave expansive powers to the EPA that are “beyond whats allowed in the constitutional mandate”, and “beyond the scope of constitutional intent,” he said. Critics of the rule say Trump’s executive order will end government overreach. They say that under the rule farmers and businesses in agriculture and real estate business may be free from costly fines, lengthy permit approvals, and violations of property rights. For example, under the rule, farmers would need to ask permission and approval from the EPA just to build a pond for their animals, which would require a significant length of time (roughly 6 months to 1.5 years) plus money to get the permits. Or, critics say, someone building a new home would have to worry about getting fined for filling in a puddle. A few years ago the EPA threatened a Wyoming man with a $37,000 daily fine, saying that he needed the agency’s permission to build a small pond for his livestock, even with a state permit. “The regulation was unnecessarily confusing. We asked for a very clear cutoff on what would be considered similarly situated waters … as to which water would need a permit and which would not. The rule that was proposed did not draw that distinction,” he said. Driscoll also said the permits were an issue as farmers usually had to go through the federal government, spending a lot of time and money. Paul Bredwell, vice president of environmental programs for the U.S. Poultry & Egg Association said the current rule is going to create issues with food security. “If we can’t have producers out there that have the ability to use their land, to produce poultry to produce forage, grains and those kinds of things, clearly it’s going to be a burden on being able to provide a continued supply,” he said. “It means that food security is going to be pressured. …That’s going to put more economic burdens on them and will potentially preclude them from expanding their farms to produce poultry or any other kind of protein,” he said. Not all agree that the rule should be repealed. Lisa Griffith, acting director for the National Family Farm Coalition said it would undermine the levels of clean water. “Water is necessary to all living things, and allowing water health and safety to be compromised for short-term industrial/corporate gain is foolish,” she said. The agricultural industry says they are not opposed to having clean water but just don’t want to be overridden with unnecessary and unclear regulations that impact their day-to-day lives. Driscoll said he appreciates Trump’s aim to replace or repeal the rule and hopes primarily to have more regulatory certainty. “Our priority is more regulatory certainty, we want to reduce the burden but what we really want is certainty, and we still want adequate protection of water resources,” Driscoll said. Reuwee says he wants to see sensible regulation from the Trump administration. Bredwell said that Trump’s executive order is a step in the right direction. “We had no opportunity [to comment] with the rule that’s currently in place. … If it gives the poultry and egg industry and all of agriculture to be involved in that conversation, I think [the order] is definitely a step in the right direction,” he said. The rule is currently in limbo, held up in court while the 6th US Circuit Court of Appeals deals with pending lawsuits. New EPA administrator Scott Pruitt must now go through the lengthy process of revoking or revising the rule. If he decides to revise the rule, he must defend the new version in court as a replacement for the original rule.